This new All-in-One printer from Hp is the answer to all your printing needs and requirements. With easy functions like print, copy & scan there is nothing this printer cannot accomplish. It has the option of colour prints in A4 at a speed of up to 5.5 ppm and black & white prints in A4 at a speed of up 7.5 ppm. What’s more, you can print all the quality photos and documents you need for a great value with HP’s lowest-priced ink cartridges. With this printer, you can count on easy versatility and absolute efficiency. Print, scan and copy what you need quickly with a reliable all-in-one. Get started in just a few simple steps. Easily set up this all-in-one to print, scan, and copy with simple controls. This new All-in-One printer from Hp is the answer to all your printing needs and requirements. With easy functions like print, copy & scan there is nothing this printer cannot accomplish. It has the option of colour prints in A4 at a speed of up to 5.5 ppm and black & white prints in A4 at a speed of up 7.5 ppm.What’s more, you can print all the quality photos and documents you need for a great value with HP’s lowest-priced ink cartridges. With this printer, you can count on easy versatility and absolute efficiency. Print, scan and copy what you need quickly with a reliable all-in-one. Get started in just a few simple steps. 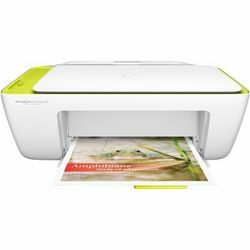 Easily set up this all-in-one to print, scan, and copy with simple controls. Additional Features Energy Savings Feature Technology: HP Auto Off Technology, Scan Resolution: Hardware - Upto 1200 x 1200 dpi, Input Modes: Front Panel Scan, Copy Speed: Black - Upto 5 cpm (Laser Comparable), Color - Upto 3 cpm (Laser Comparable), Connectivity: 1 Hi-speed USB 2.0, Storage Temperature Range: -40DegC t.